You have to love that this video, which reintroduces you to the world of Camp Firewood, is narrated by a can of vegetables. As we learn, it is so much more than a summer camp, it’s a way of life. 14-years after the first film, we return to camp to experience the first day of that most memorable, important summer. All of the key players are back, which is nuts considering how famous many of them have become in the interim. We’ll see familiar faces including Elizabeth Banks, Michael Ian Black, Bradley Cooper, Judah Friedlander, Janeane Garofalo, Joe Lo Truglio, Ken Marino, Christopher Meloni, Marguerite Moreau, Zak Orth, Amy Poehler, David Hyde Pierce, Paul Rudd, Molly Shannon, and Michael Showalter. In addition to them, we’ll meet new members of the Firewood family, like Chris Pine, Kristen Wiig, John Hamm, and tons more. 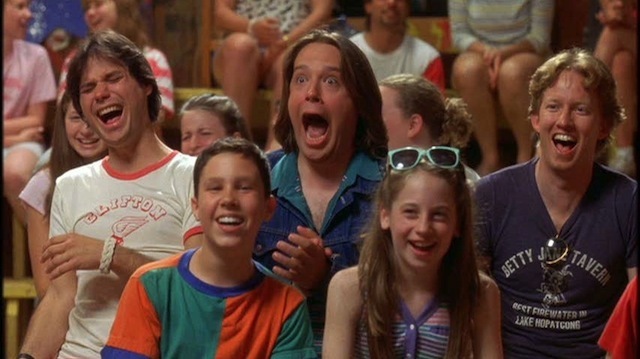 All eight episodes of Wet Hot American Summer: The First Day Of Camp hit Netflix on July 31. Hope you don’t have any plans the next morning.